Here in Somerset the wonderful optimism of a glorious spring has been diluted, since July 9th, by many torrential downpours, gloomy skies and cool winds. It is disappointing to have a third consecutive awful July (172mm of rain so far) after hoping for something better and as I write this on the 26th, there are the first patches of blight on a few leaves of potatoes and outdoor tomatoes. If this infection of potato plants spreads rapidly, I shall cut off and remove infected stems before harvesting tubers either then or as needed, probably the former as slugs are often chewing into potatoes left in the soil. Blight-infected tomato plants may not be savable but I plan to cut out infected leaves as I see them, and hope for drier weather. Once blight enters the plants. stems, they usually perish fairly quickly and fruit is best picked green if you have a use for it. Indoor tomato plants should stay healthy as long as you are careful to water only the soil at root level, always keeping leaves as dry as possible. On the other hand, rain has been good for many vegetables: parsnips, celeriac, leeks, beets, squashes, salads and brassicas are thriving, as long as slugs are kept under control. I am starting to go out at dusk or dawn with a sharp knife, not finding many slugs at present but keeping an eye out around vulnerable plants, especially young salads. Soon I shall be planting a lot of endive and radicchio which can soon diasppear in a wet August if just one large slug is on the slither. 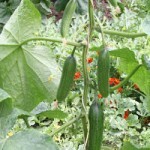 Many autumn salads can be sown in August and oriental leaves are in prime season for sowing now. Two of my favourites are the mustards Ruby Streaks (also called Red Frills) and Pizzo. The former is mild and feathery, the latter is bright green and more pungent. Most oriental leaves have quite strong flavours and it is fun to experiment and find ones you like. If you read this in time, August the 1st is an excellent day moon-wise for sowing leafy salads, as are the 9th and the 10th. Early August is the best week of the year for sowing chinese cabbage to heart in October for some welcome late salad leaves, when many others are barely growing outdoors. 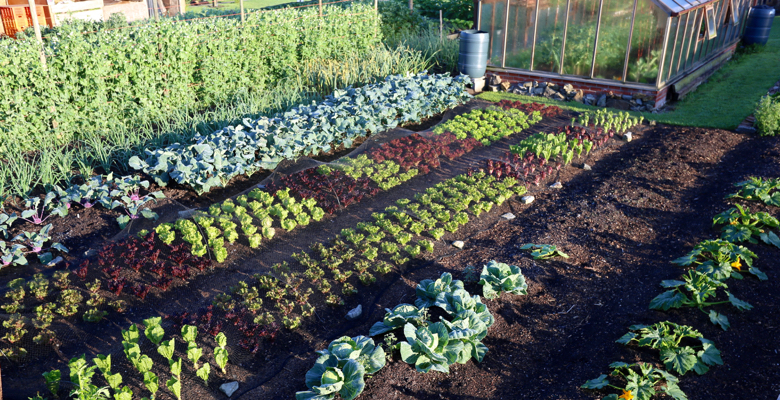 But only try it if you are on top of slugs because it is their favourite plant (along with pak choi), and a mesh or fleece cover may also be neessary in September to keep out the butterflies. Caterpillars are now becoming more numerous and occasional forays through the brassicas are worthwhile to squash them or gather them up for hen food. They usually lurk on the underside of leaves and will climb back if knocked off. Thinking ahead to next spring, I found last year that wild rocket sown in August has a great ability to survive winter as a rather scrawny plant, then to produce abundant leaves from April to June when they complement spring lettuce very nicely. You need only a few plants, spaced at the usual 22cm or 9 inches apart. Don.t harvest too many leaves in autumn to allow strong development of the roots, then tidy off dead and yellow leaves in March so that new, healthy growth is easy to cut by the handful, every three weeks or so from sometime in April or early May, depending on the weather then. Wild rocket resists flea beetle much more than salad rocket and flowers much less in spring time. Turnips are an excellent vegetable to sow now and follow nicely in the bare spaces left after harvest of many summer crops such as onions. I am thrilled with onions this year, no mildew at all and I think it is because of not growing any Japanese, overwintering onions last year: they seem to harbour the mildew in some way. 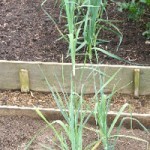 Instead of them, spring onions sown in mid to late August or in late winter can be used as early onions next May and June. Fruit-wise, I am now picking delicious plums which have benefited from extensive thinning. Currants have been superb, there is one more picking of blackcurrants and a small pick of Blanka whitecurrants, unnoticed by the blackbirds. Greengages and apricots are promising but need some sun. I now have a forum attached to this site where you can post questions and ideas. This has been prompted by enquiries I receive about the no dig approach which, although simple in principle, does benefit from practical tips such as how best to cover weeds, how much compost to use and when, and so forth. Bottom Garden late July, lettuce replaced by purple sprouting, etc. Indoors: Cucumbers, basils, tomatoes, aubergines, peppers, chillis, hopefully melons after about mid month.